Their campaign against Peking was succeeding, but General Hiroki Sato had to land his troops at Shanhai Pass, then march to the city to relieve the siege. Admiral Ako Yamamoto could barely hear above the cannon fire. “Better this than an ambush.” He returned to his binoculars and gasped. “What?” Sato took the binoculars from the terrified Yamamoto and beheld a sight he thought only possible in myth. This end of the Great Wall of China, regaled in fable as the “dragon’s head,” was proving that its name was not merely symbolic. Stone, brick, tamped earth, and wood was miraculously transforming into an enormous serpent, the legendary defender of China. A thousand men met their fate in the sea that morning in July of 1900, and then the dragon rose to destroy the rest of the invaders investing her land. I wrote this for the What Pegman Saw writing challenge. The idea is to use a Google maps street image and location as the inspiration for crafting a piece of flash fiction no more than 150 words long. My word count is 150. Today, the Pegman takes us to The Great Wall of China. As you might imagine, the wall has a long and fascinating history, which makes crafting a wee tale about it difficult. 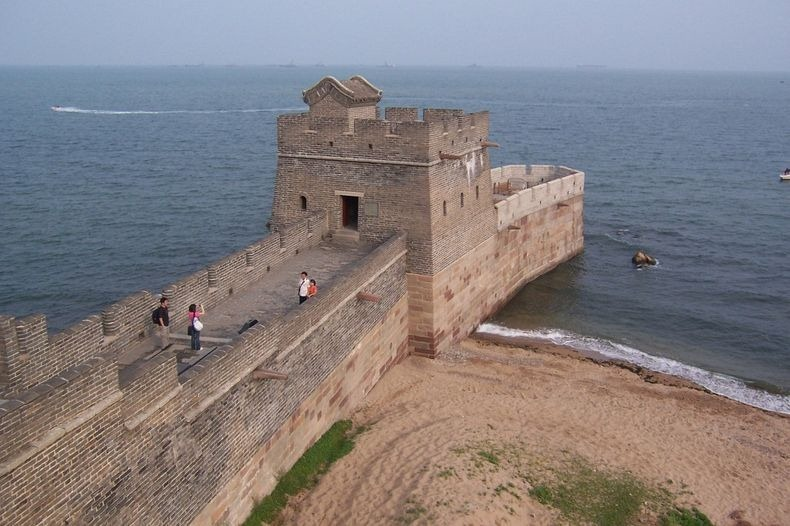 I decided to focus on its western edge, which is at Lop Nur or “Lop Lake.” I discovered that in July 1900 (or 1904 depending on the source), the Japanese landed troops at Shanhai Pass where the wall dips into the sea, to re-enforce a siege against Peking. You can click the link to Amusing Planet to learn more, but that part of the wall is called “the dragon’s head” because it looks like a dragon dipping down to have a drink from the ocean. Now imagine that the wall isn’t really a wall, and you’ve got a fantastic tale on your hands. Really cool piece of information here, James. The Meiji Japanese were all about proving their military chops. China, Russia, Korea, Manchuria, and ultimately the US and Britain. Good story. An interesting bit of history and oh, if a dragon truly had appeared, and who’s to say it didn’t? I’ve never seen this end of the wall. I’ve never been to China (or a lot of other places), but the Internet is a wonderful thing. I had a sort of mythology that the wall really was a dormant dragon that came to defend the nation in time of crisis. The problem is, different sections of the wall were built many centuries apart, so I don’t really know how that part would work. Yes, I can see how the fortification acquired its name. It would be a terrifying sight if they had sufficient artillery mounted seawards – and enough ammunition, of course. In the case of the actual historical events I used for the basis of my story, the saturation bombardment was totally unnecessary, as there were few, if any Chinese soldiers present and the pass was only lightly populated. Unfortunately, in real life, there was no dragon to act as a defender. I really enjoyed this, James. Definitely the stuff legends are built on. True, until you realize the Great Wall of China was built in sections over many centuries. How could a dragon be constructed in such a manner? Thanks. Thank you. In reading your story, we very definitely look at things in different ways. Oh, I really enjoyed that tale. A dragon’s head, indeed! And, I enjoyed the historical notations, too. Thanks. The research is educational for me, too.